It’s no secret I have a major crush on historic homes and walking the streets of old neighborhoods is one of my favorite past times. 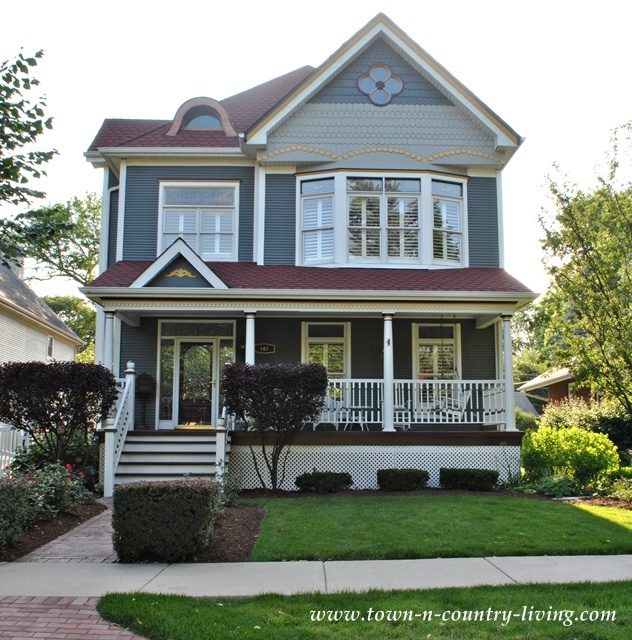 Recently my hubby and I traveled to nearby Naperville, Illinois and strolled the historic district. 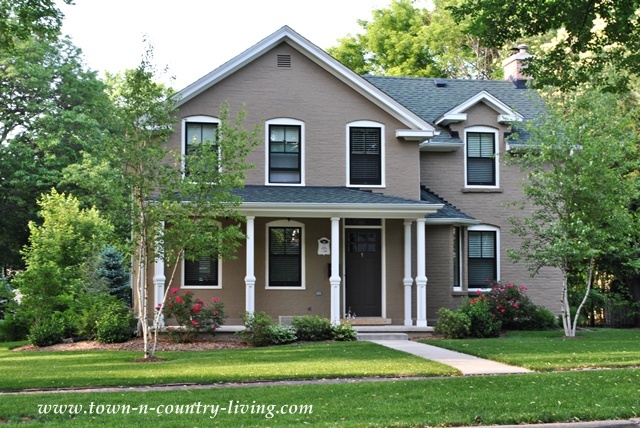 Following are some of my favorite homes in the area. 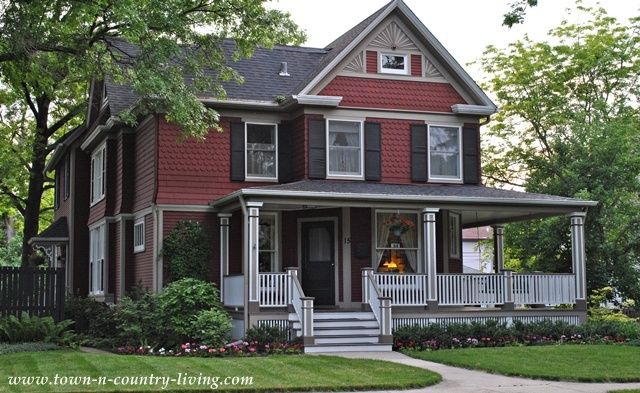 This red beauty wears two-toned trim on its wrap around porch. A bay window creates an angled wall for the front door while a lamp burns in the window. 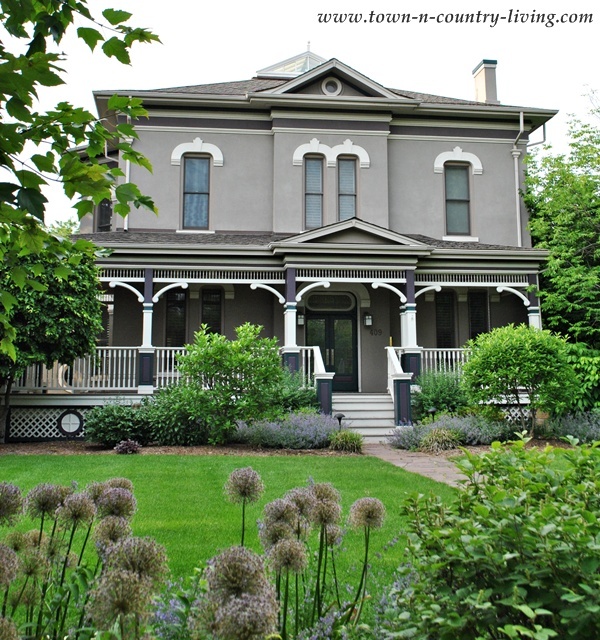 A nicely landscaped front yard hugs this gracious Victorian lady. 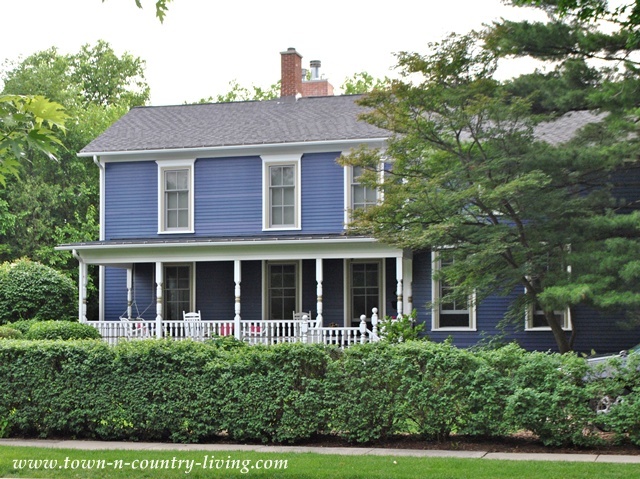 The simple lines of this unassuming home in the historic district of Naperville tugs at my heartstrings. The subtle arch of the two-toned windows and simple landscaping is charming and down to earth. Notice the curved window in the roof of this Victorian home and the floral-shaped window in the peak. The red roof is a nice complement to the gray-blue siding. 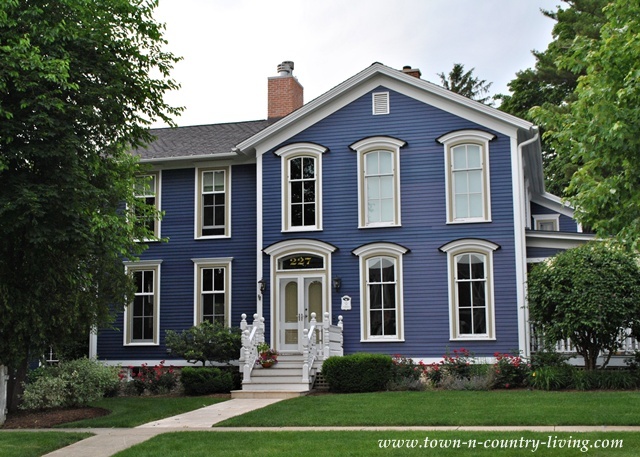 This purple historic home was my favorite on our walking tour of the historic district of Naperville, Illinois. Arched windows, two-toned trim, double front doors, and tidy landscaping all come together to create curb appeal that’s beyond charming. We stood and gazed at this house for quite awhile. As you turn the corner, you see the side porch of this beautiful home. 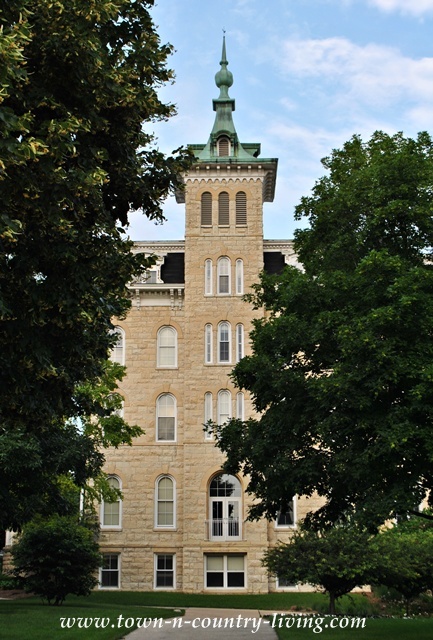 Naperville is home to North Central College, tucked in the middle of the historic district. Another painted lady graces the historic streets of this thriving Chicago suburb. A red door greats visitors to this classic farmhouse with a wrap around porch. This large home wears several colors but the softness of the hues blend beautifully. Note all the subtle details accentuated by the choice of paint colors. 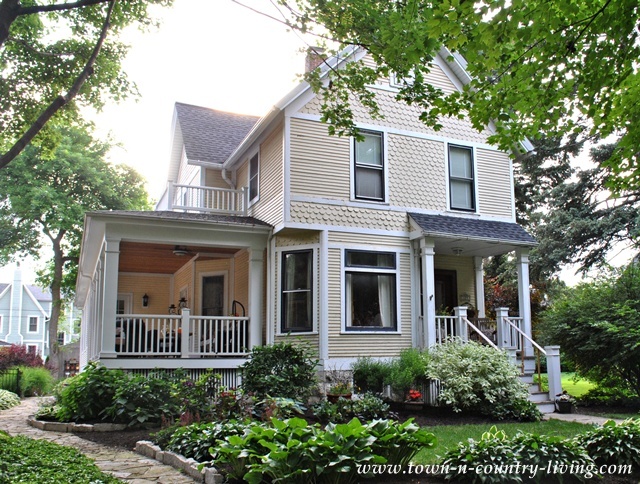 This lovely grand old home is just steps away from the downtown shopping district. 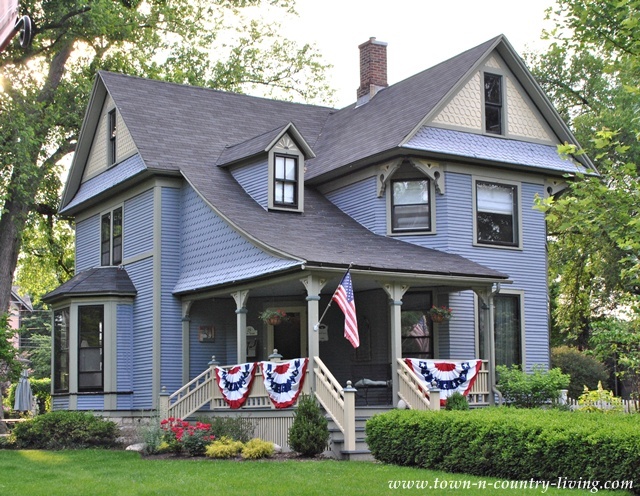 Finally, a dreamy blue Victorian all dressed up for 4th of July! Hubby and I will return here for another tour because there are lots of gorgeous old homes in this booming town. It’s also great for shopping, with a variety of stores and restaurants. What’s one of your favorite towns to visit? I love Naperville. The historic homes are so beautiful. That is the area we lived in before we moved North to Lake Zurich. It is a great community. My daughter lives and works right in downtown Naperville. I hope you were able to visit Mark’s cute shop 363 while you were in town. Gorgeous homes. 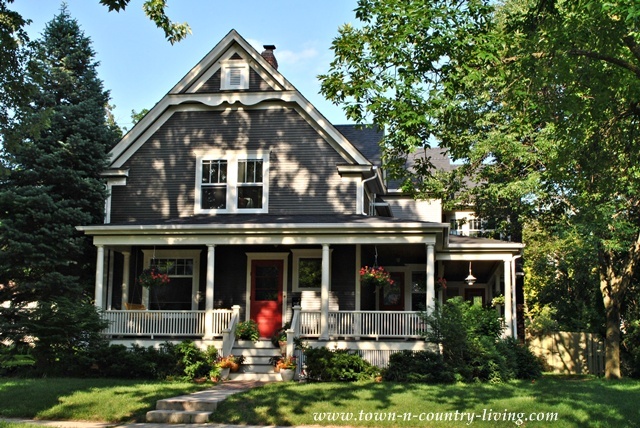 O how I love these typical American historic homes, so pretty and almost always with a porch. Something you don’t see around here. Never been there but they sure have some beautiful homes. Thanks for sharing them with us. You would LOVE to visit and see the “painted ladies’ in Bayview, Petoskey, Michigan !!!! A summer Methodist “campground” started in the late 1800’s. Just beautiful, I really couldn’t pick a favorite, loved them all! I love them all but the one with the curved windows and last one are my favorites. Beautiful pictures! I enjoyed that tour very much. The house with the flower window on the gable is my favourite, though I think I would repaint it differently if it was mine. Unless that dark colour is a historic colour? I just love your home tours. You do all the walking, and we get to sit on our comfy sofas and see all the beautiful homes! 🙂 Thanks! Love your home tours. 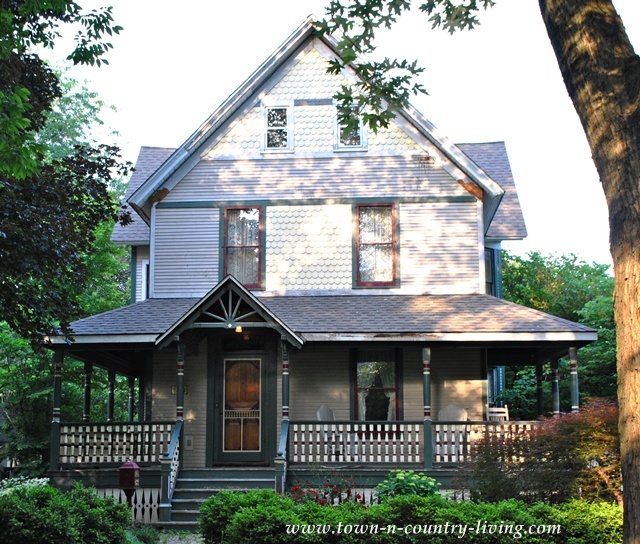 I live in the South now but grew up in McHenry, IL and grew up in a historic home. Naperville is a beautiful town! If you ever get a chance, visit Geneva and Batavia along the Fox River. They have an endless supply of restored historic homes. Thanks! Thank you for sharing these great photos. We posted our favorite photo (difficult choice) just now at the “I Love Naperville” facebook page. These houses are literally my neighbors. 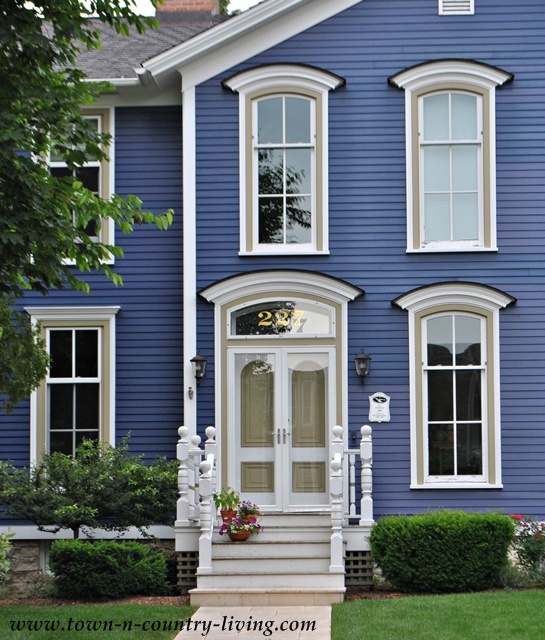 We live in the cutest cape cod in the historic district and are moving down a block to a very special Victorian, next door to your last picture. Lovely homes, lovely people, lovely town. Lucky you! Naperville is beautiful! The small elementary school in the Historic District of Naperville is organizing a Harvest House Walk, Oct 2, 2016. You should come out and enjoy these beauties inside and out!